The Fool on the Hill: Will Scotland veto #Brexit? 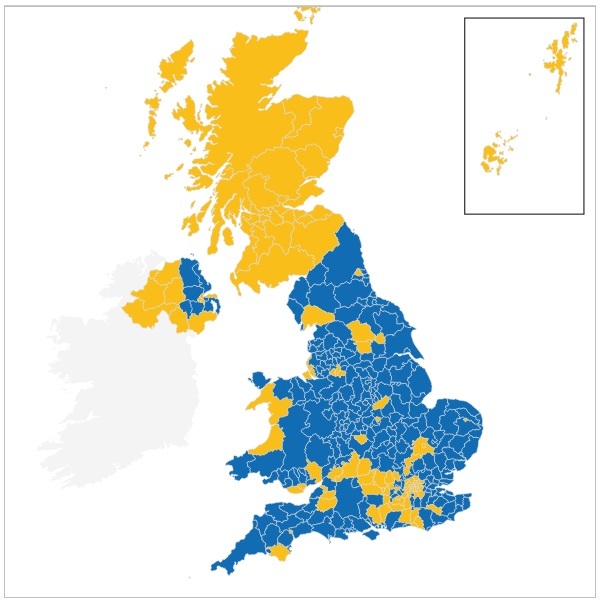 Map of EU referendum voting results, by area; blue represents 'Leave'. A Romanian friend, living and working in London, asked me today, 'is the Scottish Parliament going to veto ‪Brexit‬?' This post is my answer. Under the Scotland Act, which is the legislation which frames the powers of the Scottish Parliament, the Westminster Parliament cannot pass any act which affects the governance of Scotland without the agreement of the Scottish Parliament. So in legal theory, yes, the Scottish Parliament does have the power to veto Brexit - and ALL the parties in the Scottish Parliament (even the Scottish Conservatives) campaigned against Brexit, so if it comes to a vote there will definitely be a majority. The problem with this legal theory is that because the United Kingdom doesn't have a written constitution, there's nothing to stop the Westminster Parliament overturning the Scotland Act. There's just an agreement that they won't. If the Scottish Parliament did veto Brexit, the Westminster Parliament would then probably repeal the Scotland Act. At which point we're really in uncharted territory. Back in the 1970s, when it looked completely impossible for the SNP to get a majority of the Scottish MPs, it was widely agreed by people on both sides that if the SNP ever did get a majority of Scottish MPs that would be enough to declare independence. Now, of course, they do have. So Scotland could now just make a Unilateral Declaration of Independence, and if Westminster tried to repeal the Scotland Act I think we probably would. But that, too, would be a really messy situation. It could get as bad as civil war. I think the threat to veto Brexit is a hardball negotiating tactic. It really depends on whether the Westminster parliament wants Brexit or not. The SNP government in Scotland does not intend to allow Scotland to be taken out of the EU and is prepared to play hardball. 1: Westminster could agree to support Scottish independence if we don't veto Brexit; Scotland becomes independent and stays in the EU, while the rest of the UK leaves (and maybe Northern Ireland rejoins Ireland, but that's another potentially bloody mess). This is a good outcome for Scotland and for the pro-Brexit faction in England, but as I say could get REALLY nasty in Ireland. 2: Westminster actually doesn't want Brexit and will use the excuse 'Oh, we couldn't start Article 50 because the nasty Scots wouldn't let us' (I actually think this is quite likely because there isn't a majority for Brexit at Westminster either). 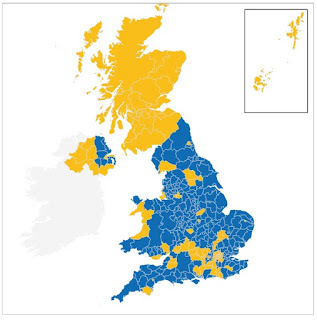 Scotland doesn't become independent and the whole of the UK remains in the EU. That sounds like the best outcome but it probably isn't because it would lead to violent anti-Scottish feeling in parts of England, and I fear that would get very nasty. 3. Westminster seeks to repeal the power of the Scottish Parliament to veto #Brexit, and Scotland declares independence. Again, there's a serious risk of trouble in Northern Ireland and I think there would probably be a lot of anti-Scottish rioting and violence in places in England. As I said before I think there could even be civil war. If there were a big majority for Brexit in England the sensible thing all round would be a friendly separation, England and Wales leave the EU and gradually diminish into a bankrupt and irrelevant basket case of a country, while Scotland remains in an EU which will probably not have a very bright future itself (because as well as destabilising Britain, Brexit has destabilised Europe). But the truth is that while Scotland had a convincing majority for Remain, England did not have a convincing majority for Leave. It was, across the whole country, a matter of around 2%. So after people have had a month or two to calm down, England as a whole might actually be grateful for Scotland vetoing Brexit. Even that isn't a great situation, because the rest of the EU is going to be utterly and rightly pissed off with the UK for creating this mess. But it might mean the UK would, for the time being, stay together and stay in the EU.